Posted by Editor at 5:03 PM . Left-arm spinner Ahmed Farooq’s record-breaking haul of eight wickets powered Karachi Public School to an emphatic seven-wicket victory over Al Hameed Secondary School in their Group F encounter at the Eastern Star Ground while Happy Palace School whipped Zaheer Public School by 134 runs in their Group B fixture at the Hussain Lawai Naya Nazimabad Stadium in the Omar Trophy Inter-School Cricket Tournament 2016, being organized by the Pakistan Veterans Cricket Association (PVCA), on September 29. 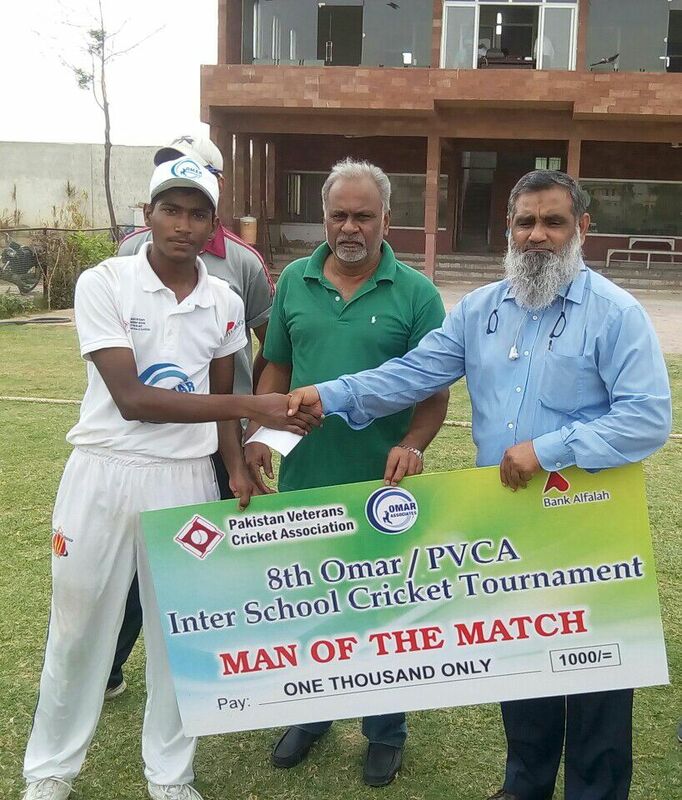 Karachi Public School’s Ahmed Farooq set a new tournament record by claiming eight wickets, giving away only 18 runs in his spell of 7.4 overs two of which were maidens. He followed it up with an unbeaten 30 off 33 balls to cap one of the best all-round performances in the history of the competition. Ahmed Farooq’s devastating spell of left-arm spin bowling sent Al Hameed Secondary School crashing to 66 all out in 21.4 overs as they lost their last nine wickets for only 17 runs after opener Mehrab Khan (23 off 34 balls) and Hamza Iqbal (23off 37 balls) had added 48 for second wicket. Chasing a modest target of 67 in 40 overs, Karachi Public School lost both the openers cheaply to medium-pacer Haseebuddin before Ahmed Farooq closed the deal with his steady knock as the winning runs came in only the 13th over. They were put on top by the 134-run third wicket partnership between Shafiq Ahmed (81 off 111 balls) and Sameer Khan Khan (56 off 72 balls) after both the openers had been run out by the brilliance of Mohammad Saad. Zaheer Public School’s medium-pacers Mohammad Bilal (3-21) and Syed Essa (2-34) stemmed the flow of runs in the closing stages by picking up crucial wickets which limited the total below 250. But the task of scoring 236 in 40 overs beyond the reach of the Zaheer Public School batsmen and they were bowled out for 101 in 18.3 overs. Only Mohammad Adnan (22 off 26 balls) and Mohammad Saad (20 off 21 balls) could enter double figures as the wickets kept on falling regularly. Medium-pacers Hamza Qureshi (2-23) and Sharif Shakeel (2-26) were the pick of the Happy Palace School bowlers but Man of the Match award was clinched by their number three batsman Shafiq Ahmed for his knock of 81.